JEAN ANN RYAN PRODUCTIONS rated by USA TODAY as the "World's Best Cruise Line Entertainment is Casting for 16 current production shows on board 6-star Cruise Lines. Presented by Jean Ann Ryan Productions Ltd.
By Arrangement with The Really Useful Group Limited. All artists wishing to be considered should make a personal 2 minute video, with 30 seconds introduction about themselves, and a 1 and a half minute song appropriate to the position they are auditioning for, preferably with backing. This tape does not need to be of broadcast quality but good enough to show the qualities of the artist. The artist's video should be uploaded to an online storage facility (such as YouTube or Vimeo) and a link with current CV and head shot sent to Neil Rutherford at the email address above. Please do not send video files directly to Neil Rutherford, just the link. 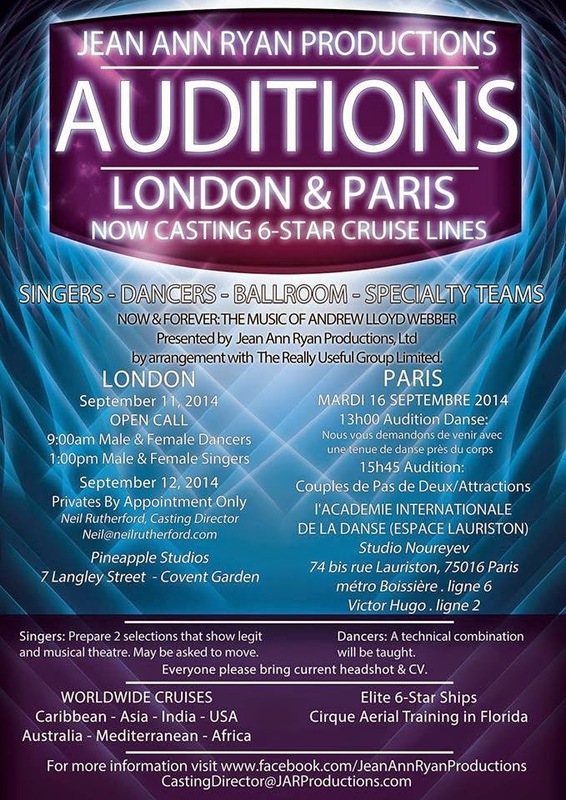 If successful, artists will then receive an appointment to attend live auditions in London on 12th September 2014. Jean Ann Ryan Productions is now casting for 16 current production shows on board the fleets of Regent Seven Seas Cruises and Oceania Cruises. Also casting for NOW AND FOREVER, THE MUSIC OF ANDREW LLOYD WEBBER, which features the most memorable scores from The Phantom Of The Opera, Love Never Dies, Jesus Christ Superstar, Joseph, CATS, Starlight Express, Sunset Boulevard, Song and Dance, and Whistle Down the Wind. Performers are considered for employment on deluxe, six-star fleets, traveling exotic and around-the-world-itineraries, with all meals included, and white-glove service. Guests traveling on board these ships are among the world’s elite. Contracts are generally 6 months to one year in length and include round trip airfare. Rehearsals in Fort Lauderdale with deluxe accommodations. World Cruises and Exotic Itineraries include: Europe, Alaska, the Hawaiian Islands, the Caribbean, South America, USA, Australia, India, New Zealand, Singapore and Indonesia. Female singers should have two selections prepared. One from classical musical theatre preferably Andrew Lloyd Webber show and the second a contemporary pop selection. Seeking Legit Sopranos and Mezzo Belters. An accompanist will be provided. Please provide sheet music in proper key. Male singers should have two selections prepared. One from classical musical theatre preferably Andrew Lloyd Webber or Boublil-Schonberg and the second a contemporary pop selection. seeking dynamic, charismatic showman who can showcase the music of Billy Joel and Elton John. Be prepared to sing: "Don't Let the Sun Go Down on Me". All singers should show versatility in their voice. Singers may be asked to return the same day to take a singers movement combination. All dancers must be classically trained in ballet. Other styles of dance should include jazz & contemporary. We are also seeking Champion Ballroom Teams. Teams should attend the Open Dance Call and submit your current demo materials. If you are a solo quality singer, please come prepared with one legit & one musical theatre voice. Seeking performers of all ethnicities. All performers should bring their current headshot & CV.